In the Chinese calendar, the Year of the Snake comes every twelve years. For Pierre Alechinsky, a founding member of COBRA (an acronym for the cities that contributed members to the group, Copenhagen, Brussels, and Amsterdam), the Year of the Snake can be an auspicious one. 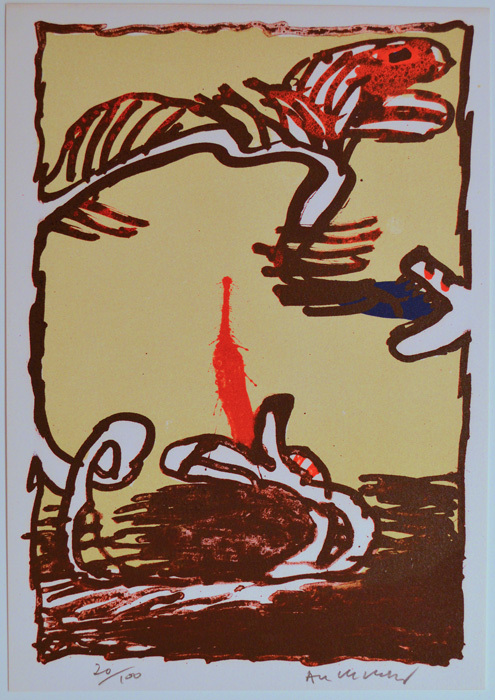 In 1977, also the Year of the Snake, Alechinsky was awarded the first Andrew W. Mellon Prize for Painting and executed one of the prints we are featuring, also called The Year of the Snake. Spaightwood Galleries began in 1980, so we missed our 1977 observance, but by 1989, Alechinsky's Guggenheim retrospective (which had been traveling in Europe for almost two years) had finally come to its end, and Spaightwood presented our first major Alechinsky show and purchased a small oil painting on canvas by the artist. 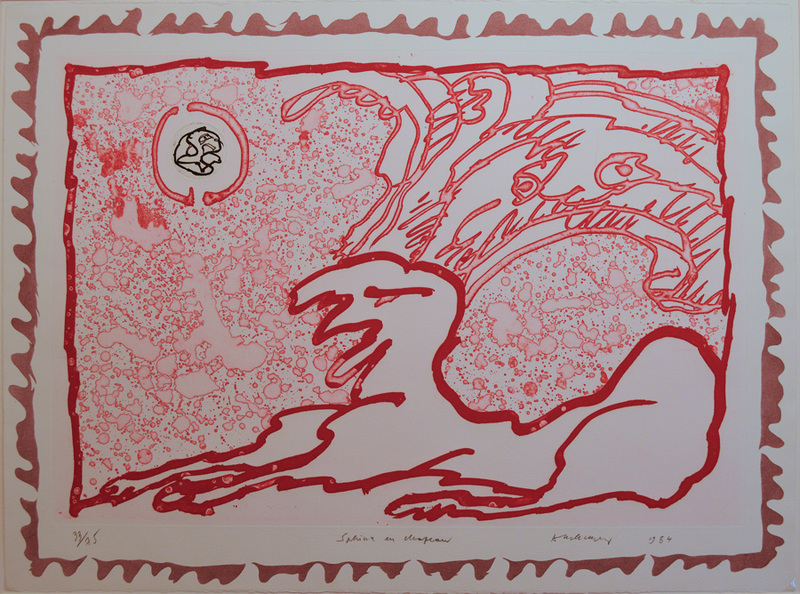 In 2001, we once again celebrated the Year of the Snake with an Alechinsky show, founded upon our acquisition of large numbers of the two pieces published in 1977 to celebrate his Mellon prize and augmented by many more recent etchings and lithographs published by Galerie Lelong. Now, in 2013, as the Year of the Snake winds down to its close no sooner than mid-April, we are presenting our largest Alechinsky show to date. In our Upton space, we can fit more Alechinsky’s on the walls than ever before97 on the walls (some of them quite large) and more leaning against the bookshelves beneath the walls where the others are hangingand we plan to luxuriate in lots of Alechinsky's favorite images: maps, Papiers traités, Central Park, snakes, volcanoes, gardens, dog-kings, smiling crocodiles and sea monsters, and people existing as best they can in a world that often seems to invite extreme emotional responses. (Sometimes you just want to scream! )We are featuring lots of Alechinsky's favorite images: Central Park, snakes, volcanoes, gardens, dog-kings, smiling crocodiles and sea monsters, and people existing as best they can in a world that often seems to invite extreme emotional responses. (Sometimes you just want to scream!) Still, the central act of Alechinsky's art is the making of marks on a sheet of paper, on a canvas, on a copperplate, on a lithographic stone: for that is what distinguishes artists (visual or verbal) from destroyers. 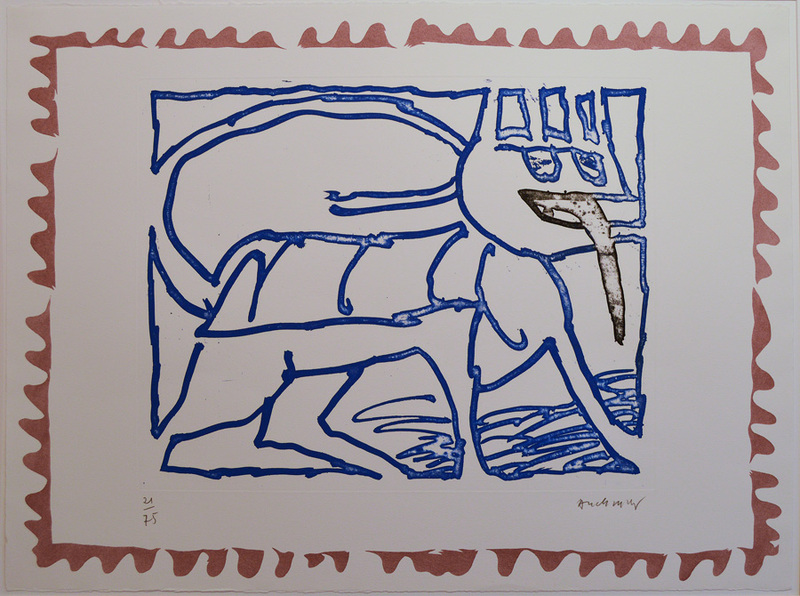 Le Chien Roi / The Dog King (GL 38, 1990) Original color etching with pochoir, 1984 75 signed & numbered impressions. Image size: 565x760mm. Price: $5500.. The white areas are actually white. Ce hors là (A. 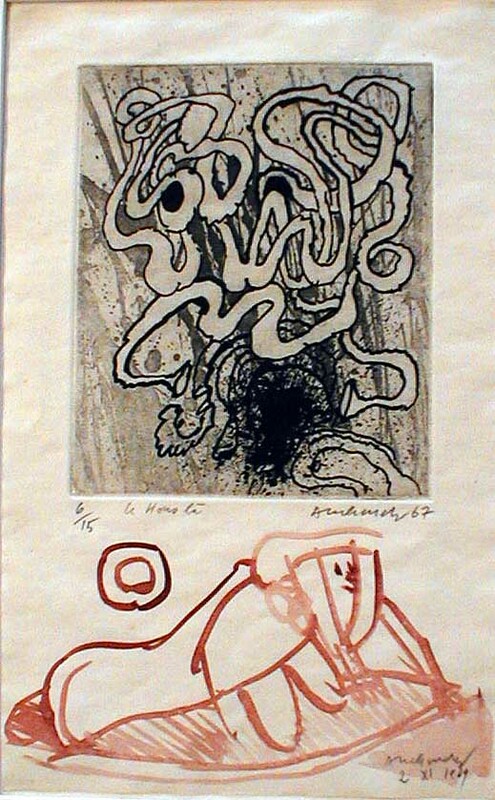 337), Original etching, 1967. 15 signed and numbered impressions. In 1969, Alechinsky added a drawing in the lower margin of this print. Sun bather. Brush and ink drawing, 1969. Dated 2 November 1969 (see aboce for detail). 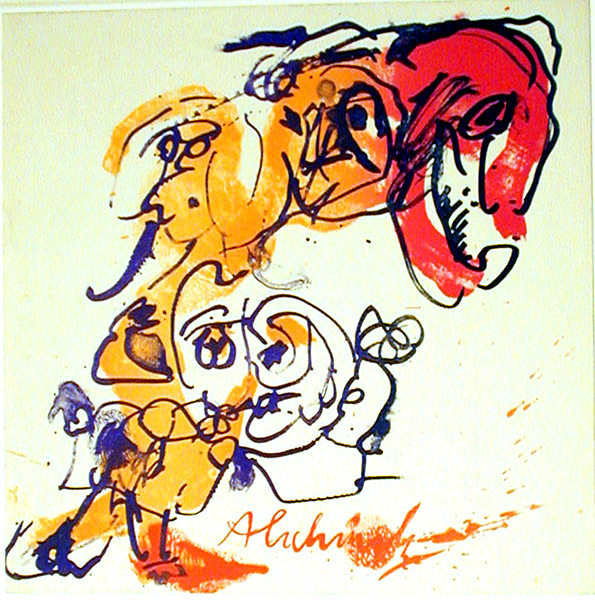 One of Alechinsky's rarest prints combined with an original drawing. Unique! Image size: 195x160mm. Price: SOLD. Predateur. 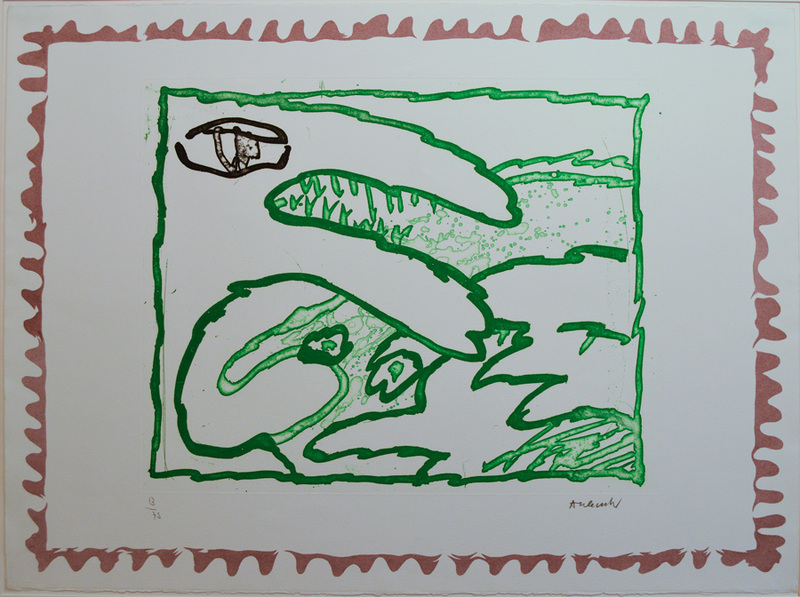 Original color lithograph and etching, 1983. 120 signed & numbered impressions on Arches wove paper; our impression is n. 28/120. This is one of only 26 prints to be inckuded in Alechinsky's 1987 Exhibnition at the Guggenheim Museum. The show then travelled to the Musée des Beaux-Arts in Brussels and the Musée d'Art Moderne de la Ville de Paris. Once again, a map is the beginning of our journey into the realm of the imagination, sometimes a scary place filed with predators unknown to our waking moments, sometimes with those scary dreams transformed as in the round etching bottom right. Image size: 825x610mm (matted in a 36x28 inch sheet of archival acid-free museum board). Price: $4500. Sphinx en chapeau / Sphinx wearing a hat (GL 38, 1990). Original color etching with pochoir, 1984. 75 signed & numbered impressions. Image size: 565x760mm. Price: $5500. Snake Fish. Original color lithograph, 1977. 100 signed and numbered impressions. 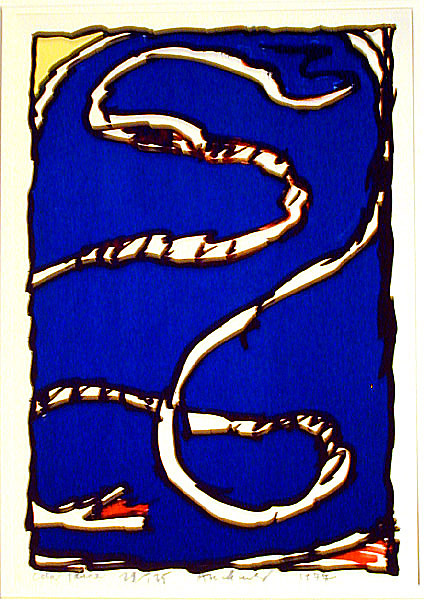 Executed to commemorate Alechinsky's receipt of the Mellon Prize in 1977 (the "Year of the Snake" in the Chinese calendar), this accompanied the deluxe edition of Alechinsky's Painting's and Writings published to accompany his exhibition at the Carnegie Institue. Image size: 300x210mm. Price: $1250. Sans Titre II (A. 207). Original color lithograph, 1963. 120 signed & numbered impressions plus 3000 unsigned impressions for an exhibition catalogue. Signed in the stone. Image size: 170x185mm. Price: $600. Coin jaune / The yellow corner. Original color lithograph, 1977. 125 signed and numbered impressions. If we begin by focusing on the yellow corner top left, the snake, fangs gaping, comes as something of a surprise. Don't they always! Image size: 399x201mm. Price: SOLD. Herbe potager. 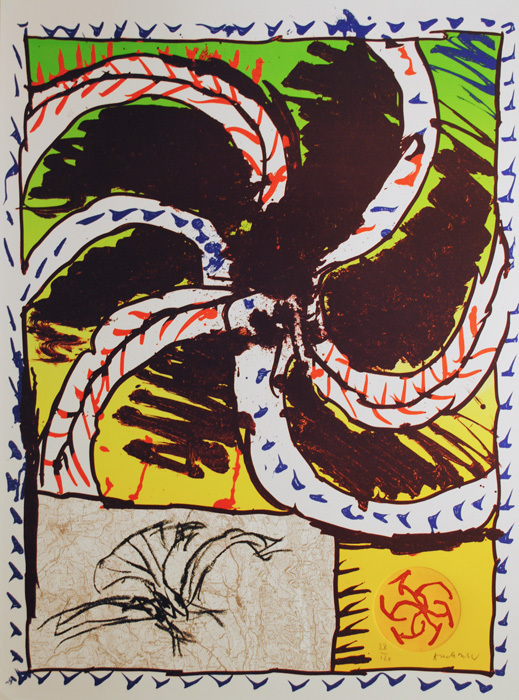 Original color lithograph and etching, 1977. 125 signed and numbered impressions, of which ours is n. 60/125.. Image size: 645x385mm. Price: $3250. The white areas are actually white (as in the center box with the etched figure in blue). De toutes partes (GL 41, 1990). Original color etching with pochoir, 1984. 75 signed & numbered impressions. Image size: 565x760mm. Price: $5500.